When Voros McCracken wrote his seminal piece on pitching and defense 11 years ago, he helped change the way people — fans, writers, even general managers — think about run prevention in baseball. Where once we used to throw most of the blame for a hit on the pitcher who gave it up, McCracken helped us realize that a slew of other factors go into whether a ball hit into play falls for a hit. For many people in the game and others who simply watch it, our ability to recognize the influence of defense, park effects, and dumb luck can be traced back to that one little article. Today, we have multiple stats that can help us better understand a pitcher’s influence on the game. Fair Run Average (FRA), Fielding Independent Pitching (FIP), and Expected Fielding Independent Pitching (xFIP) all attempt to parse the events a pitcher best controls from those over which he has the least control. The fantasy implications seem obvious. If a pitcher, say, posts a much higher ERA than xFIP for a few weeks or a few months, we might expect luck to start working in his favor in the future, and for his ERA (and other fantasy stats) to start improving. If he puts up a much lower ERA than xFIP, you could argue that his good fortune might be due to run out soon. Except it’s not quite that simple. Advanced stats such as these don’t necessarily account for fundamental changes in a pitcher’s ability, nor for injuries. Say a pitcher loses three miles off his fastball, or starts missing his spots badly, grooving pitches right down the middle. That could result in a flood of hits and home runs, as hitters square up those fat pitches more often. Yet because a stat like xFIP doesn’t penalize pitchers for high batting averages on balls in play or for a high percentage of fly balls leaving the park, it might miss those changes in health or ability. With all that in mind, let’s look at five pitchers with ERAs at least a run higher than their xFIPs, and see whether or not they present fantasy buying opportunities. FanGraphs’ Dave Cameron covered Shields last week, citing Shields’s rare combination of high strikeout rate and high ground ball rate as reasons to rate him as a true ace in the making. 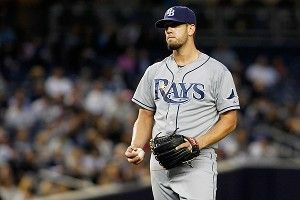 The high strikeout rate isn’t new, with Shields fanning 8.3, 8.1, and 8.8 batters per nine innings in 2010, 2011, and 2012. The ground ball barrage is new, though: Shields’s 58.4 percent rate ranks third among all starters, blowing away his previous career high of 46.3 percent. What’s caused the change? A plunge in four-seam fastballs, a big uptick in cutters thrown, and a few more changeups. Over the years, Shields has come to realize that his standard fastball isn’t fast enough (it averages 91.7 mph this year) to overpower hitters and is usually his worst pitch — verses his changeup, which is perennially his most effective pitch. So he’s now throwing more cutters to induce ground balls, and using his changeup to generate a big chunk of his strikeouts. Only one below-average power-hitting team in the bunch, and a full quarter of his starts against the best-slugging team in baseball. Problem is, even with half of his starts already coming against powerful AL East opponents, the unbalanced schedule means he could face those same long ball troubles for the rest of the season. The Rays do have Jennings back, and hope to get Longoria healthy soon, which would help shore up that uncharacteristically porous team defense. But given Shields already has a strong reputation among fantasy owners, as well as the tough competition he’ll face as long as he pitches in the AL East, he doesn’t fit the profile of an ideal buy-low pitcher. Pass. Dillon Gee, the 11th-best starting pitcher in baseball? Going by xFIP, apparently so.The 26 year old has improved considerably since his first full season in 2011: He’s striking out two more batters per nine innings (now at 8.3), walking a batter and a half less (now 2.4), and posting a gaudy 54.6 ground ball rate. Like Shields, Gee’s getting hurt by a high BABIP (.319), high HB/FB rate (15.4 percent), and low strand rate (68.4 percent). Unlike Shields, Gee lacks name recognition (even diehard baseball fans who aren’t Mets fans have to be a bit surprised to see his numbers) and plays in a division that only features one top offensive opponent (the Braves). He’s on the waiver wire in many standard mixed leagues and can likely be had cheap via trades in deep leagues. Invest. the opposite of whatever he was last year, he’ll get to beat up on weak opponents all year long. Invest. We’ve called out Francisco Liriano and Phil Hughes as two of the most maddening pitchers in the game; if Max Scherzer’s not in that tier, he’s not too far off. Scherzer has been the most prolific strikeout pitcher in the majors this season, whiffing 11.7 batters per nine innings. But two situational flaws have wrecked his ERA: He’s allowing an OPS 137 points higher with men on base than with the bases empty, and he’s getting creamed by left-handed hitters, yielding an Andrew McCutchen-like line of .346/.408/.559 against them. As he has in the past, Scherzer got destroyed in his first few starts, ironed out his mechanics, then returned looking like vintage Dwight Gooden, striking out 24 batters and walking one during a two-start stretch against the Pirates and Twins. But he hasn’t sustained that performance, getting lit up for eight runs by the Indians in 4 1/3 Wednesday night. Where you go from here depends largely on where you are in your league’s standings. If you’re hurting for strikeouts and can withstand a potential hit to your ratios, Invest. Just know that Scherzer’s owner might be smitten enough by his strikeouts and stubborn enough about waiting for 1985 Doc to return that the cost might exceed his likely output. We’ve covered Lincecum earlier this season, and the prognosis remains the same: He’ll have occasional starts where he looks unhittable. But between his significantly lower fastball velocity and the command troubles which have led to more balls down the heart of the plate and a lot more line drives, you’ve got the rare pitcher who’s still going to strike out a ton of hitters, but also get lit up more than you’d like. And that’s before we get to Lincecum’s career-high walk rate of 4.8 free passes per nine innings, the fifth-highest mark among all starters. This is a classic case of xFIP seeing only the numbers, and missing a serious erosion in skills for what was once one of the two or three best pitchers on the planet. Plus if Max Scherzer’s owner might be tempted to hoard him based on what could be, imagine how the guy who spent $27 or a high draft pick on Lincecum feels. This is too tough a situation to hope for a profitable trade. Sadly, Pass.